The Nicolas Sinebrychoff Challenge is a two part race for classic 6mR. It has a challenger race followed by best of three match race against the defender. 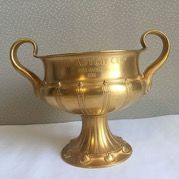 The trophy is the second oldest sports trophy after the America’s cup which is still competed. The cup was originally donated by Nicolas Sinebrychoff, a keen sailor and the heir of the oldest brewery in the Nordics which is still active today. The trophy was designed by Oscar Kleined and donated on the 25th anniversary of NJK. The perpetual Six Metre World Cup Trophy was donated in 1973 jointly by the Puget Sound Six Meter Association and the Port of Seattle. The competition for the Six Metre World Cup Trophy is open to all International Six Metre yachts holding a valid measurement certificate. The Trophy is awarded to the winning yacht at the International Six Metre World Championship. 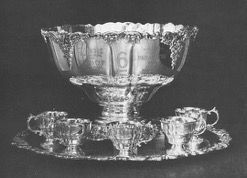 The Trophy is composed of a large silver plate bowl inscribed “Six Metre World Cup” and a wooden base encircled with plaques inscribed with all previous winners of the trophy. The Trophy is kept at the premises of the current champion’s yacht club, which is responsible for the Trophy’s safekeeping, the engraving for its champion’s year, and delivery to the location of the next International Six Metre World Championship. The DJINN Trophy was donated in 1979 to honour the memory of Harry Morgan, who owned US80 DJINN. The trophy consists of a large teak base mounted with a circular ceramic tile engraved with an image of DJINN sailing in Bermuda in 1938. The names of past winners are inscribed on plaques on the lower part of the trophy. The DJINN Trophy is also governed by this Deed of Gift. The Trophy is awarded to the highest placed Classic at the International Six Metre World Championship. For the purpose of this trophy, Classic is defined as a boat first constructed and/or certificated before December 31, 1965 and built according to Class rules and guidelines. Replicas of such yachts whose construction has been endorsed by the International Six Metre Association Classics and Technical Committees are also eligible to compete for the DJINN Trophy. The Trophy is kept at the premises of the winner’s yacht club, which is responsible for the Trophy’s safekeeping, the engraving of its winner’s year, and delivery to the location of the next International Six Metre World Championship. In addition, winners of the DJINN Trophy receive a memento plaque depicting DJINN, which they may keep. The original trophy donated by KSSS (Royal Swedish Yacht Club) was lost over time, but was replaced through the generosity of Matt Brooks in 2013. It consists of a sterling silver bowl manufactured by Georg Jensen sitting atop a wooden base. A silver band encircling the upper part of the base is inscribed with the words “Kungl Svenska Segel Sallskapet”. There are several silver plaques on the lower base inscribed with past winners of the trophy. The awarding of this trophy is also governed by the Deed of Gift. The Trophy is awarded to the highest placed Classic yacht built to the First (1907-1919) or Second (1919- 1933) International Rule which retains its original underwater configuration at the International Six Metre World Championship. All yachts in this category must also carry a valid and current measurement certificate. The Trophy is kept at the premises of the winner’s yacht club, which is responsible for the Trophy’s safekeeping, the engraving for its winner’s year, and delivery to the location of the next International Six Metre World Championship. 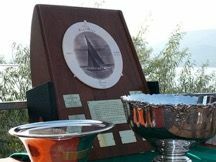 This trophy was donated to the International Six Metre Class by Matt Brooks to honour the memory of Lucie Bedford Warren, namesake of the yacht US 55 Lucie, and who was an energetic and keen competitor in the Class. Mrs. Warren raced ‘sixes’ in the U.S.A., Bermuda, Canada and in Europe. 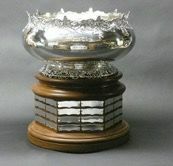 The trophy is an ornate sterling silver bowl sitting atop a wooden base. Silver plaques cover the hexagonal middle section of the base; eight plaques on each face. The Trophy is awarded at the International Six Metre World Championship and at the International Six Metre European Championship to the highest placed yacht at the end of racing which includes a woman as helmsperson or crew. In the event of a tie, the tied yacht with the most women wins the Trophy. If two or more yachts remain tied, the tied scores shall be resolved by the methods outlined in the Racing Rules of Sailing, Appendix A – Scoring to determine the winning yacht. If the result remains a tie, the trophy shall be held jointly and each yacht will have the right to engrave their name on a plaque. The Trophy is kept at the premises of the current winner’s yacht club, which is responsible for the Trophy’s safekeeping, the engraving of its winner’s year, and delivery to the location of the next International Six Metre World Championship or European Championship, whichever is next to be contested. See also the separate Deed of Gift for this Trophy. 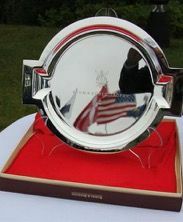 This trophy was donated to the International Six Metre Class by Don Wood of the Royal Thames Yacht Club. The trophy consists of a Six Metre sculpted in stainless steel. The Trophy is awarded at the International Six Metre World Championship and at the International Six Metre European Championship to the highest placed boat among those first constructed and certificated as a Six Metre between 1966 and 6 September 1979 (the date of the first race of the 1979 World Championships) inclusive, which have had no alteration to their underwater shape other than permitted modifications to the rudder. Owners will be expected to make a declaration that their boats comply with this requirement. Should any rudder modification have been carried out, the rudder shall have a maximum thickness (athwartship dimension) of no more than 95mm. The Trophy is kept at the premises of the current winner’s yacht club, which is responsible for the Trophy’s safekeeping, the engraving for its winner’s year, and delivery to the location of the next International Six Metre World Championship or European Championship, whichever is next to be contested. 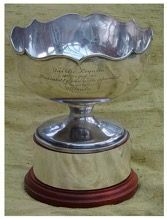 The Merula Trophy was donated in 2015 by the East India Club Yacht Squadron. The trophy is a silver bowl mounted on a base. The competition for the Merula Trophy shall be open to all International Six Metre yachts holding a valid measurement certificate. The Trophy is awarded at the International Six Metre World Championship and at the International Six Metre European Championship to the highest placed Classic yacht built to the First (1907- 1919) International Rule which retains its original underwater configuration. All yachts in this category must also carry a valid and current measurement certificate. The Trophy is to be kept at the premises of the winner’s yacht club, which is responsible for the Trophy’s safekeeping, the engraving for its winner’s year, and delivery to the location of the next International Six Metre Championship. The Astor Cup has been loaned by the IYRS School of Technology and Trades of Newport Rhode Island. The trophy is a gold bowl to be known as the IYRS Astor Cup. The Cup shall be awarded at the International Six Metre World Championship and at the International Six Metre European Championship to the highest placed yacht at the end of racing which includes a person aged 25 years or under as helmsperson or crew. In the event of a tie, the Cup will be awarded to the yacht with the most wins. If the result remains a tie, the tied scores shall be resolved by the method reasonably and fairly determined by the Race Committee of the event. 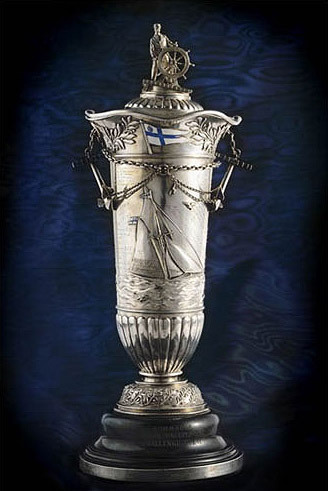 The Trophy is to be kept at the premises of the current winner’s yacht club, which is responsible for the Trophy’s safekeeping, the engraving for its winner’s year, and delivery to the location of the next International Six Metre World Championship or European Championship, whichever is next to be contested. See also the separate Deed of Gift for this Trophy.